When you join DNA you become a part of a growing nationwide network of dermatology nurse leaders who promote the highest standards of dermatologic nursing care. On this page, you will find information about membership and member benefits. See our DNA Membership Brochure here! 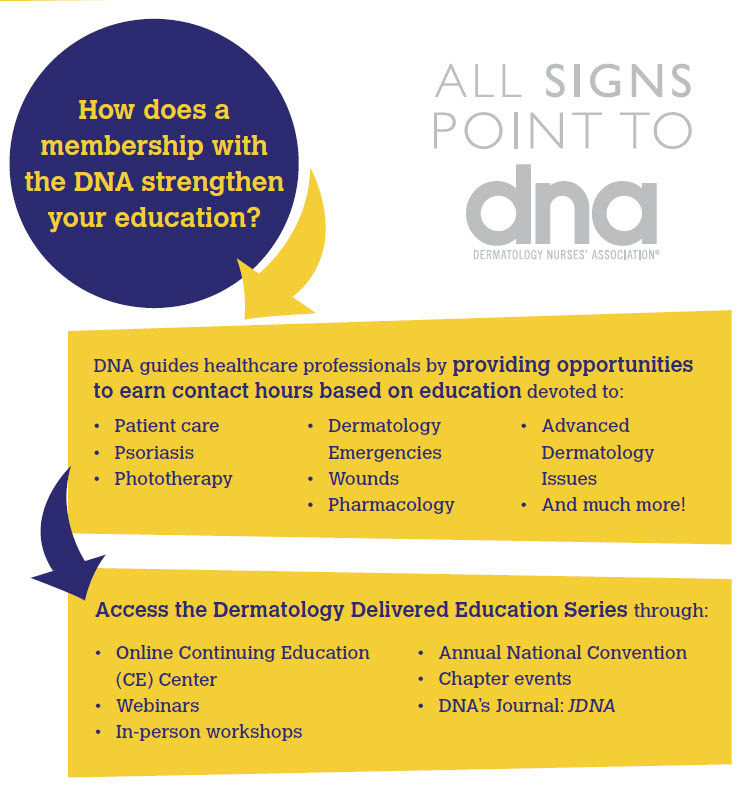 Doctors: Learn why a DNA membership is important for your practice. Nurse members are licensed, registered, practical or vocational nurses involved or interested in the dermatology nursing care of patients. Annual membership for Registered Nurse and LPN/LVN members is $85. Nurse Practitioner members are nurse practitioners whose mission is to promote excellence in dermatologic care by providing education, networking and support for nurse practitioners in dermatology. Annual membership for Nurse Practitioners is $135 (includes NP Society). Associate members are members of related health care fields who are involved or interested in the care of dermatology patients. Associate members have all DNA benefits except voting and office holding privileges. Annual membership for Medical Assistant and Physicians Assistant members is $75. Student members are defined as individuals studying to be an entry-level nurse (RN) and who have not yet achieved their nursing degree. Student members receive many DNA benefits electronically, such as the quarterly Focus Newsletter online, the weekly DNA MultiBrief eNewsletter, and bi-monthly email member updates. Student members will also receive special registration rates to all DNA events. To join the DNA as a Student Member, please submit this printed application. Each additional year is $25 (proof of student status required). A subscription to the Journal of the Dermatology Nurses’ Association (JDNA) can be purchased for $12.00. Corporate members are individuals or organizations interested in supporting the purpose of DNA and serve in an advisory capacity to the Board of Directors. Corporate membership does not confer voting privileges or active participation in DNA activities. Annual membership for Corporate members is $3,000. Learn about Corporate Member benefits here. Lifetime members maintain all the benefits of nurse members and can hold office and vote, without an annual membership fee. This membership recognizes the contributions of each past president to the DNA. Educational offerings are geared to all levels of expertise. DNA features several days of concurrent sessions, symposia and workshops, approved for continuing nursing education credits. The most current clinical concepts are presented at these educational programs during the DNA’s Annual Convention each year. As a member, you will receive the Focus newsletter, a quarterly publication that provides news about DNA, its members, chapters, and educational opportunities; and the Journal of the Dermatology Nurses’ Association, the DNA’s official bi-monthly journal containing current developments and research in dermatology nursing. A number of prestigious awards, education scholarships and grants are presented to DNA members at the Annual Convention. Members are eligible to apply for these awards and are encouraged to nominate their colleagues or themselves. DNA’s Annual Convention is a must-attend event for all dermatology nurses. DNA’s 38th Annual Convention will be held on March 18 – March 21, 2020 at the Crowne Plaza Denver in Denver, CO. In a special tribute to Joan Shelk, DNA Past President and the developer of our first workshops, a special phototherapy program has been developed. The Joan Shelk Fundamentals of Phototherapy Workshop is an intensive one-day training for those administering light therapy under a doctor’s supervision. This workshop covers psoriasis and other photo-responsive skin diseases. DNA is the place to meet and learn from others in different clinical settings (outpatient, private practice, academic, government, etc.) and specialties (cosmetic, oncology, dermatological surgery, general dermatology, etc.) that are done through our local chapter events!